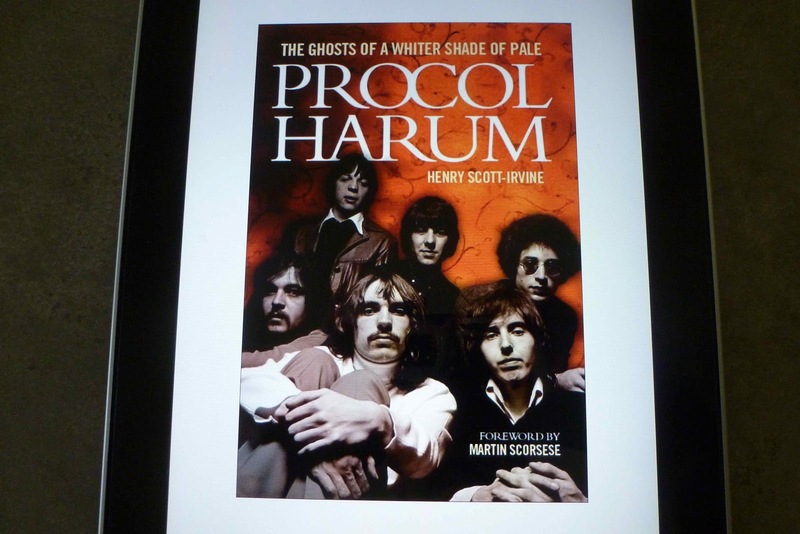 The Little House of Concrete Bookshelves: Henry Scott-Irvine "Procol Harum - The Ghosts of A Whiter Shade of Pale"
There’s a delicate balance that comes with the territory when someone ventures into the realm of music biography. If you’re writing about anyone below genuine superstar status, where almost anything anyone might want to know is already out there in the public domain you’re going to need to consider the demands of three different and quite distinct audiences. Take a group like Procol Harum, and you’ve got a perfect encapsulation of the issue. The first sector of the audience are the casual fans, the people who, in this case, would recall A Whiter Shade of Pale, note that they liked it, had always wondered what it was about and had always wondered about the band who took it to the top of the charts back in 1967. It’s a group who’ll find Procol Harum - The Ghosts of A Whiter Shade of Pale an interesting read, since Henry Scott-Irvine covers the band’s early history back to Gary Brooker's first outfit, The Paramounts, the Southend R&B band who might have garnered high praise from the likes of The Rolling Stones and The Beatles (who they opened for) and Sandie Shaw (who they backed on tour). The circumstances that brought about pianist and singer Gary Brooker’s songwriting partnership with lyricist Keith Reid are covered thoroughly, as is the courtroom fallout when A Whiter Shade of Pale hit the top of the charts and former members of the band jumped in for a share of the proceeds and the more recent law suit launched by organist Matthew Fisher some thirty-eight years after the event claiming a share in the copyright as a co-writer of the multimillion-selling song that continues to generate a strong stream of royalties. The casual fan may well be surprised to learn that, between the original release of AWSoP and the court case Procol Harum released a string of fairly highly acclaimed albums (Shine on Brightly, A Salty Dog, Grand Hotel), toured extensively, produced some of the earliest (and best) rock collaborations in an orchestral setting and were a major drawcard in the United States through the seventies, though their prog rock credentials didn’t count for much when the punk rockers hit town. One step up from the casual fan is the bloke who, much like myself, has heard the albums, has a bit of the sense of the chronology and wants to be reminded of the detail. Again, Scott-Irvine does a rather good job in that regard, carrying the narrative forward through the personnel changes, money problems that stemmed from dodgy management, legal costs and, in places, downright bad luck. They could, for example, have played Woodstock, but they’d already played a string of festivals that American summer and opted to head home instead. It’s not, however, a book for the obsessive fan, the Procol Harum Trainspotting Anorak. While it’s an interesting, easy and enjoyable read there isn’t a great deal here that wasn’t either known or suspected. It’s quite possible the unknown and unsuspected only exists in minimal quantity, but there’s definitely room for a detailed album by album discussion of the contents of a significant though largely ignored or forgotten musical legacy. One thing that does come across strongly is the deliberate modelling of the Procol Harum instrumental lineup on the dual keyboards piano/organ combination employed by Bob Dylan and The Hawks (later, of course, The Band) at Manchester’s Free Trade Hall and elsewhere on the 1966 World Tour, along with the influence of The Young Rascals. There’s at least one intriguing side note that I, for one, would have thought was worth checking out. Joe Boyd’s White Bicycles has Procol lyricist Keith Reid turning up on the doorstep of Elektra Records’ London office (Boyd was the label’s British rep) looking for a deal based solely on some typewritten verses. I found him amiable but crazy. Who ever signed someone on the basis of a few stanzas of doggerel? (White Bicycles Kindle edition, Location 2116) and Boyd booked the band to play London’s UFO Club the evening 'A Whiter Shade of Pale' was released, which rates a mention here as the band’s live debut and has Reid mentioning the visit at the time, though there’s no earlier reference to the incident. Trainspotting, perhaps, but it’s an intriguing incidental that I thought was worth a wry paragraph. Equally interesting, on a similar maybe over the top but definitely intriguing note was the similarity between The Paramounts’ origins (Southend is right on the Thames estuary, and merchant seamen brought in obscure rock, R&B and blues titles unavailable in England through standard record shops) and the likes of The Beatles (Liverpool) and The Animals (Newcastle-on-Tyne). There’s a brief mention of groups of their ilk playing songs they’d discovered on imported records here, but it’s an intriguing point that might have been worth exploring further. I’m also intrigued by a couple of passing references to the late, great Vivian Stanshall, also a native of Southend, who must have had some link with the Paramount/Procol scene apart from a co-write with Keith Reid referred to here. But that’s nit-picking. As a reasonably detailed biography Procol Harum - The Ghosts of A Whiter Shade of Pale does everything you’d expect it to do if you’ve read a number of similar volumes, it’s reasonably detailed but with a lot skimmed over, covers all the major points but could do with a bit more depth. There’s no doubting the depth of Scott-Irvine’s research, and the extensive list of interviewees include practically everyone who has ever been involved with Procol Harum (the notable exception being the late BJ Wilson, who died before the project started), producer Chris Thomas, Cream lyricist Pete Brown and Led Zeppelin's Jimmy Page. He doesn’t skirt around the Matthew Fisher lawsuit, though it’s subject matter that’s always going to be a little more than merely contentious and the inclusion of court documents in the appendix section of the book gives the reader the opportunity to explore the matter if you’re so inclined and find the content in the book itself lacking in detail. There’s a fairly thorough discussion of the band’s groundbreaking orchestral concerts, Gary Brooker's solo ventures and side excursions with the likes of Eric Clapton and Bill Wyman, you get to read the long lost third verse of A Whiter Shade of Pale (not that I was much the wiser after I’d done so) and the volume sports the regulation big name contributions (Foreword by Martin Scorsese, Introduction by Sir Alan Parker and Afterword by Sebastian Faulks). All in all, one of the better examples of in-depth rock biography for the general fan, though the old anorak may find the mileage varying.